My car made a left turn rather than a right. I was driving home from work, not feeling very good, like I had a sickness coming on. And, to tell the truth, feeling a little down in the dumps. 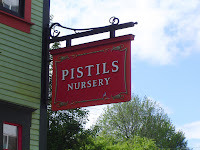 The sun had come out again (after a rainy day) and I guessed a little stroll through Pistils might make things better. It’s a small nursery I hardly ever go to, and I never really buy much there, so it would just be a quick (cheap) stop, and on my way. This cute scene was the first thing I saw, aren’t they just adorable? Since the chickens all usually run free around here it was odd to see them behind wire. Must be protecting the little ones. Wait a second what is this!? NOT FAIR! Look at that bud! This little pip squeak is in a 1 gallon pot and already has a bloom ready to happen? 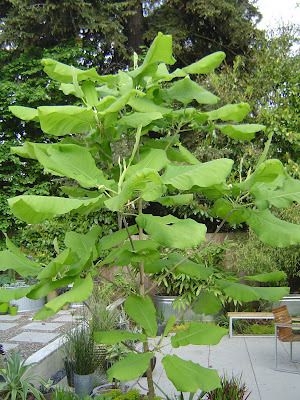 Clifford, our big leaf Magnolia, is over 9ft tall, been in the ground for almost 4 yrs, and we have never had a single bloom. Something is wrong with this picture! Reading the tag I see it is living up to its reputation perfectly. I guess we didn’t choose our Magnolia very wisely. 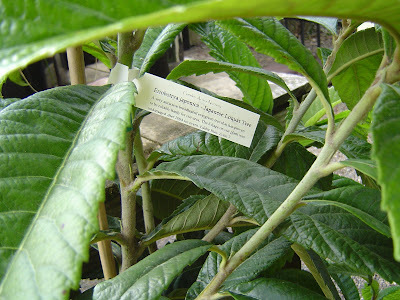 I’ve never really understood the fuss over Loquats. 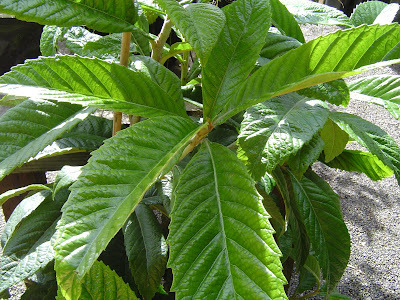 But then maybe I have never really seen one in person, I love this plant! Look at those leaves…gorgeous. Only $40…oh, but it’s marked Sold. Well that’s good because I really don’t have any place for it. But now I know, and I will start scheming about where I can put one! 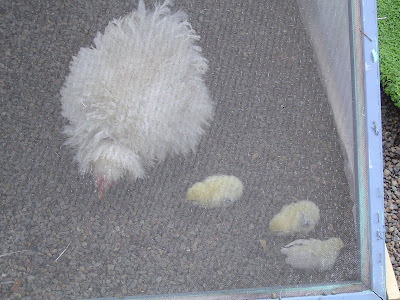 Look more chickens, aren’t they cute? 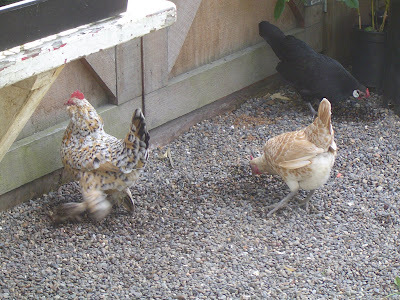 They were digging at the gravel with their feet to get at the wet stuff underneath, and then pecking at it. For the water or little bugs? Don’t know, but standing in the sun watching them helped my mood and I left feeling better than when I arrived. And I didn’t even purchase a single plant! I’m making the bed this morning, and looking out the window at Clifford and feeling cheated. I’m thinking about that gorgeous bud at Pistils and wonder when we’ll get to see one. That’s when I see IT! Up top…could it possibly be? No, just wishful thinking. I move closer to the window to get a better view, oh gosh. I grab the camera and the husband and we head out to get a look see. It is! OMG! We are going to be grandparents, gotta go buy the champagne! 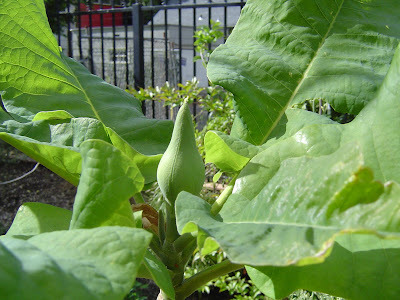 Our Clifford is going to bloom! Yay, Clifford! Congratulations! 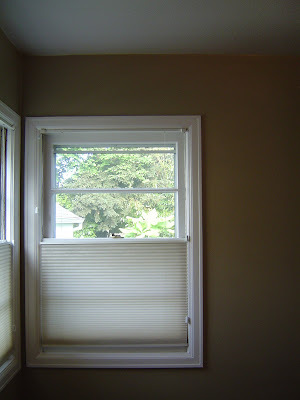 He must have sensed you were pining for another magnolia and figured it was time to give something back. Although those leaves! Those are good just on their own. I would rush down to Pistils and pick up the one you saw, if only I could find a place to put it. I love Loquats. Mine developed some sort of pest that's ruining the new leaves, so I recently relocated it hoping it would be more robust in a more prime planting location, but it's too soon to tell. I always have to stop and touch the leaves on the one outside the Chinese Garden. 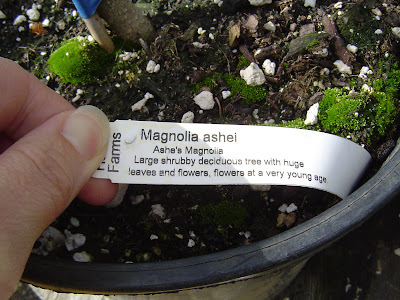 Ha, do all your plants have names? Or just the charismatic ones? 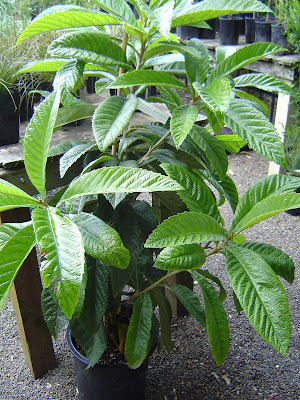 Loquat is a popular screening shrub here in Austin. They look pretty good mixed with tropicals, esp. around pools. The leaves are fabulous Megan, I love them! And so easy to clean up after in the fall since you can just pick up the leaves rather than rake them. 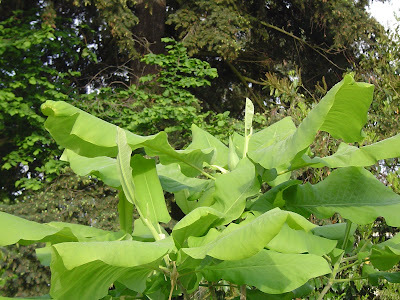 Like a banana they are susceptible to wind (and hail) damage though. Would you believe I've only been to the Chinese Garden once? I've got to fix that. Only the charismatic ones Pam! Sammy, Clifford and Mr Big (the Agave americana) are it, so far. Andrew named Clifford and I named Sammy. My Big just evolved from my referring to it as "the big one". I'm with Megan - What you did at Pistals was the plant version of stopping by a singles bar, and Clifford sensed it. He's throwing you a bone to keep you faithful. Oh gosh...I feel kind of dirty! Susan I didn't really cheat! I just thought "what if..."
Well, I don't know how big your garden is, but there's no harm in having two of a plant you really love, right? So Clifford had better keep up the good work or he might get sibling someday. Or rival. 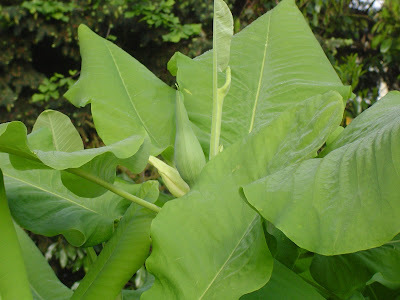 Yet another plant I had never heard of. I think you guys have cooler nurseries in Portland, I've never seen anything like that up here! What an amazing day! Sometimes flowers pop out unexpectedly!. Perhaps this is what joy of gardening is all about :-) Have a wonderful day appreciating Clifford! Karen - we have been scheming where to plant another magnolia, but I think I we'll be going with an evergreen variety next time. So Clifford may indeed be carrying this load all by himself! And you guys have 4 of my fav nurseries up there...Swansons in the Crown Hill neighborhood (if I remember the area name right), City Peoples Garden store on Madison, the one at U-Village whose name I can't remember and then of course Molbaks in Woodinville. Gosh now I want to plan a trip to Seattle! Stephanie - I think you summed it up perfectly!